It's finally here!!!! The third season has started for the Naptown Roller Girls. Last Saturday our Tornado Sirens hit the track and faced off against the Steel City Derby Demons. I've been trying to do my part in promoting the team through all my social networks, upcoming and eventful. I don't think they really needed my help since the home opener's online tickets sold out a day or two before the bout. On game day there were only paper tickets left at the box office, which also eventually sold out. Luckily my wife and I bought season tickets this year! None of our friends bought tickets before hand, so we showed up when tickets went on sale at five to make sure they could get in. We were probably some of the first fans to show up. The crowd really started to gather around quarter to six. We grabbed a spot in line so that we could get first pick of suicide seats. In three seasons of derby action, this was my first time in the suicide seats. We ended up getting a nice spot in the third turn. But alas, no roller girls ended up in our laps. 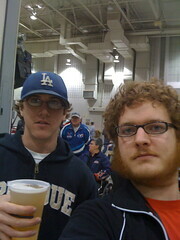 As we settled into our seats the first order of business was to get some beers. I was surprised to find that there was a nice selection of imports and micro brews on tap! Roller derby just got that much sweeter. In addition to the usual Bud and Bud Light they had Stella Artois, Red Hook ESB, Goose Island Winter Warmer and something else that escapes me at the moment. While waiting for the bout to start I noticed there was a new scoreboard set up. At first glance it seemed to be an improvement. But once the bout started, it was hard to read the time remaining. This season brings some other changes with it as well. The bout is now divided into halves instead of periods. There are also a few other changes to the rules. But by far the biggest change this year for the Sirens is their uniforms. They've switched to a sportier red and black jersey and ditched the Jerry Lee western style shirts. I'll miss the old uniforms, they were so freakin' cool! The Sirens jumped out to an early lead at the beginning of the first half and the crowd was at fever pitch. You could feel the excitement brewing in the air. They went back and forth a bit and then the Derby Demons hit their stride. They grabbed the lead and never looked back. 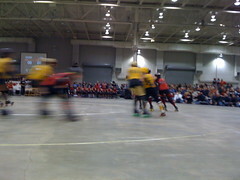 Just before halftime, the Derby Demons put up a twenty point jam that the Sirens couldn't overcome. They went into the half down thirty points with the score 55-25. Despite our team getting crushed the crowd was still energized most of the second half. The final score ended up being 99-44 in favor of Steel City. Just as you could feel the excitement in the first half, you could sense the disappointment at the end of the bout. Luckily we have lot's more derby action coming up! This year the Sirens are joined by their junior varsity team the Warning Belles. The next bout will be the debut of the new JV team. There will also be two double headers this year featuring the Warning Belles and the Tornado Sirens!! It's going to be a fun season, get your tickets and join us!